San Vincenzo has played a significant role in the life of the inhabitants of Craco for nearly two hundred and fifty years. When 1500 Crachesi left Craco for North America at the turn of the century, they brought with them their devotion for their venerated patron saint. As these immigrants assimilated into a new culture and moved away from their enclaves, San Vincenzo’s story and traditions began to fade into the past. Soon they would have been lost forever to future generations. Individuals such as Anna LoCicero, Stephen LaRocca and the Gallo family deserve our deepest gratitude for their valiant efforts to keep San Vincenzo’s memory alive through the years by sponsoring masses on the fourth Sunday in October honoring our patron saint and protector. The Craco Society is committed to join them and to continue to research and document historical data and help rekindle these passions that our ancestors held so dear. The following links represent a compilation of many sources of written and photographic history. Our mission to learn more about San Vincenzo and the traditions carried to America by our ancestors is an ongoing endeavor. If you have any information, remembrances or photographs that you can share with us, please contact us. The Craco Society has compiled a booklet to commemorate the blessing of a historic statue of San Vincenzo during a special Mass at St. Joseph’s Church in New York City. This unique statue was presented to the Society during the 2008 Reunion. With this gift comes the responsibility to understand the story of San Vincenzo and it is our hope that this publication documents and preserves culturally significant items about San Vincenzo and Crachesi history and traditions. 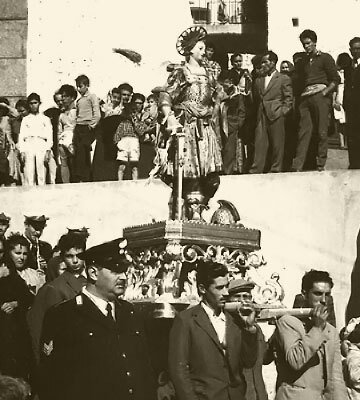 Since 1769, Craco remains home to the relic of San Vincenzo, and the processional statue carried through the streets during the Festa honoring the venerated patron saint of Craco. Originally kept in the Cappella di San Pietro, alongside the Monastery of the Order of Observant Friars Minor, in the early 1970’s they were relocated to a temporary shelter after a landslide. 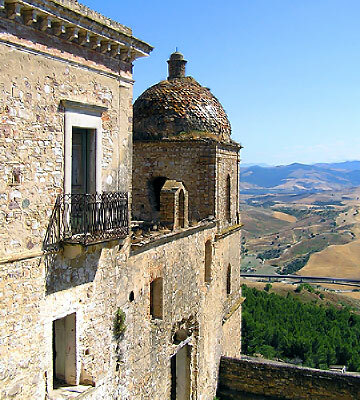 Around 2001, the sacred relic and statue were then moved to a small church in the Sant’Angelo section of Craco. Those of our ancestors who left Craco for a life in the new world brought many of their customs and religious beliefs with them. These included replicas of the relic and a slightly different interpretation of the processional statue than that in Craco. Originally, they were housed in San Joachim’s Church on Roosevelt St., in New York City. When San Joachim’s was destroyed in the 1950’s, they spent the next 10 years safely stored in the basement of the Gallo family of Brooklyn. The reclining statue and a sacred bone relic found a safe haven in St. Joseph’s Church on Monroe St. on the lower east side of Manhattan, where they remain to this day. In 2010, The Craco Society’s members funded a restoration of this priceless artifact. The processional statue was brought to San Rosalia’s Church in Brooklyn. It is believed to have been relegated to storage and the effects of time left it in need of restoration that could not be supported. It apparently was destroyed, but our search will continue until a definitive answer is found. Upon their arrival in New York, many Crachesi joined together to share their passion for their patron saint and created an organization that would allow them to socialize with their paesani. The Societa San Vincenzo Martire di Craco was formed in 1900 and remained in existence until the outbreak of World War II. Their banner, as well as many priceless photographs, were generously donated to The Craco Society by the Gallo family. Also, a group photograph of the Societa San Vincenzo di Craco, circa 1938, was presented by the Tocci family. They represent an important piece of the cultural history of Crachesi immigrants. Upon the disbandment of the Societa San Vincenzo Martire di Craco, Frank Paul Colabella commissioned a smaller statue of San Vincenzo to be created for his home. When he passed away, the statue was inherited by his daughter and her husband, Camille & Vincent Niceforo. When the Niceforo’s learned of The Craco Society and our mission, they graciously donated this family heirloom to the Society during our second annual reunion in August of 2008. As part of the annual San Vincenzo Mass held at St. Joseph’s Church in New York City on October 26,2008, this statue received a special blessing from Father Walter Tonelotto. Crachesi have been praying to their venerated Patron Saint since his arrival in Craco almost two hundred and fifty years ago. Over the years, prayer cards were made to help spread his story and honor his life and sacrifice. Additionally, Giovanni Curcio, a Crachesi immigrant, in the early 1900’s composed a prayer to SanVincenzo, which was featured during the 2010 Mass and unveiling of the latest restoration.